Courier VS Air Freight VS Sea Freight! Shipping from China – it’s one of the topics that I receive the most questions about, which is really not surprising – after all how do you know what shipping terms to use (EXW, FOB, CNF etc.) or what shipping method (courier, air freight, sea freight) or even which company to go with! It’s not an exaggeration to say that shipping from China can be very daunting and it’s enough by itself to put off a would-be importer. However as always I am here to help and I’ve answered most of these shipping questions already in dedicated posts on this blog, which you can find here: How to Import Products From China & CNF, CIF and FOB Explained. So what is today’s post all about? Well I decided to put together a real life example order and then approach a few different companies for shipping quotes – that way we can put my advice to the test and see what the results are for real! Without any further ado, let’s get to it! For this test I created an actual order of 50 pieces of a particular product, packaged into cartons of 5 pieces, with each carton weighing 18 kgs and having a total volume of 0.1 m3. That meant for our order of 50 pcs that we have a total weight of 180 kilos and a total volume of 1 m3 – which is a fairly standard mid-sized order. I didn’t want to make it so small that courier is the only option but I also didn’t want to make it a full container load as then that would give an unfair advantage to the freight forwarders. Overall I think this order size is a good balance between the two. This is usually the easiest method of shipping from China and the one that I recommend using if your order is 50kg or less with fairly normal dimensions. So how did they fare with this slightly larger order? Well the quote for door to door shipping via UPS came to $1350, which is £930 using the current exchange rate. That gives a cost per kg of £5.04 – just a tiny bit over the £4 – £5 that I suggested in my How to Import Products From China guide. However, this order is for a much larger quantity and the cost per piece at £930 is extremely high, cutting away nearly all of the potential profit. For the air freight quote I decided to use good old Woodland Global for this. They’re the company that I’ve recommended for a number of years to anyone who is looking for a freight forwarding company to handle their imports from China, due to their competitive pricing and (more importantly) high level of service. Let’s hope they don’t let me down now! That gives a final price which is less than half of the courier fee! And at £2.44 per kg, it is right within my estimated £2 – £3 / kg when using air freight. So a big result for the air freight company, which just leaves our final “contender” in this import showdown – sea freight. No, that’s not a typo! £180 delivered from the Shenzhen port to a doorstep within the UK, including the freight, import handling and all other shipping fees. That is over 5 times cheaper than the courier quote I received from the supplier. And as if that wasn’t impressive enough, the price remains the same all the way up to 25 cartons. So even if my order is twice as big, the cost of shipping is still 5 times less! Just to illustrate the difference in another way – using a courier the shipping cost per item was £18.60 – using a freight forwarder via sea freight that was brought down to £3.60! That in itself is the difference between an unprofitable product and a profitable one. I hope now you can really see why I always talk about using a freight forwarder and ordering in as large a quantity as you can – it brings your total cost down significantly, which at the end of the day means more money in your pocket! Of course it wouldn’t be fair if I didn’t point out that the courier offers 3-4 day shipping, air freight 4-5 day, and sea freight roughly 30-40 days so if you do need your order urgently, then you’ll have no choice but to pay more. And that pretty much brings us to the end of today’s post. I hope you’ve found this simple test useful and that it’s really illustrated and backed up some of the advice that I’ve given out in previous blog posts. As always if you have any questions or comments then I’d love to hear them, so please post below and I’ll personally get back to you within 24 hours. PS – Though it hopefully goes without saying, I do want to point out that I contacted all of the companies without them knowing who I was or that the quotes they were providing were for this test. As far as the companies here were concerned, they were simply dealing with another sole trader looking to put together their first order from China. Thank you for all the fantastic and free information and apologies if you have answered this question before. Do you get your products shipped directly from the supplier to the FBA warehouse or do you prefer to get them shipped to yourself so you can inspect them? I get them shipped to myself first, yes. To inspect everything properly and to send off to Amazon in batches as needed, to save on storage fees. Sorry I should have added more detail to my initial question. I am based in EU (Bulgaria) and I was planning to ship directly to FBA. In my situation, in terms of costs, it would be more expensive to ship China-Bulgaria then Bulgaria – UK. I know it is a hypothetical question, but if you were in my situation, would you pay the extra cost to ship CN-BG then BG-UK for the benefit of inspecting and re-packaging the stock? Do you know how other non-UK based sellers do it, or if you wanted to sell in the US for example, would you still ship to the UK first? Sorry for the long and messy question but thought I’d ask as it is really important for me. No, you don’t have to ship to the Bulgaria first. You ship to the UK, use a freight forwarder who can act as a importer on your behalf, clear goods through customs. Then – send goods to a UK based Amazon prep company who can check goods for you, store them/send to Amazon. OR you can do a FULL product inspection in China, check all items 100% and use freight forwarder to send everything directly to Amazon, after goods have been cleared through Customs. Hopefully, I’m an exception from the rule, but I was unpleasantly surprised when I got my airfreight quote from Woodland Global. I have been using a courier company (DHL or TNT)for importing some small but heavy products from China and for 100kg I’ve paid 260USD (excluding customs clearance fee) which gives me 2.6 USD (or £2.1) per kg. It’s much cheaper than the typical price range given in your post. I can only presume that the manufacturer is hiding shipping cost in the product price or something like that. Now about the WG quote: I was quoted for the same product in 2 cartons 100kg in total- via airfreight – around £508 (also excluding customs clearance fee). This gives me more than £5 per kg. So in my case the cost of using courier service vs airfreight is somehow reversed. If you can think of anything that I could miss or get wrong when asking for the quote from Woodland Global I would much appreciate your comment. £2.1 per kg is something un-heard of, seriously. Your supplier probably pays most of the shipping cost for you as that price is unreal. I currently use express and sea freight but never took any notice of airfreight until I saw your cost with woodland global (who i currently use for sea freight). To obtain such a fantastic price £2.50/KG which port did you ask to ship from and is there a min kilo amount you would recommend to get such a price. I have some products that already sell well and this price would double my profit. Again thanks so much for all your advice. I’m trying to import some products from China to UK. The supplier gave me the FOB price, however as advised I have contacted Woodland asking them for a door to door cost. The product will be packed into 3 cartons with a total weight of 65 kgs and 0.18m3. I gave the collection address from the supplier’s factory to Woodland and their price for Air Freight was GBP 657.73 and for Sea Fright GBP 456.45 (without buying customs docs in China – 90USD, telex release, inspection fees, duty and VAT). I’m a bit scared of these prices to be honest for 65 kgs. Around GBP 8 / kg for sea freight and GBP 10 / kg for Air Freight (without duty and VAT). EXW Charges – USD 349 – GBP 281.45 . Is this because they consider EXW instead of FOB price because I have asked them for door to door? Not sure if I they can collect from Shanghai port instead of collect from the factory? Maybe in this case they can charge me only for the freight not for collection as well? You want to ask supplier to send goods to port, to WG so that you don’t have to pay inland fees to WG. FOB price means that supplier sends good to port, so you should be covered by that already and price of goods shouldn’t change. – Do I need a EORI number regardless of the shipping method? – In your examples above, are we talking about shipping costs only? What about the custom duty taxes and VAT for HMRC? Will the price given by a courier include those or does it come on top of it? Same for the freight forwarder, will their quote include the duty taxes and VAT or not? I am struggling to understand at what point a courier or a freight forwarder is involved when it comes to me as a receiver of the goods to pay the custom duty and VAT. Yes, you’ll need EORI number on shipments above certain value regardless of the shipping method. It’s best to simply register for EORI number (it’s free) when your first shipment is in transit and you have shipment details, as you will need to provide them on EORI reg form. Import duty & VAT is usually NOT included in shipping quotes. So you have to calculate this separately. Awesome website. First-time question, as well as first-time importer. Have you ever imported from Taiwan? Are you aware of any particular issues with regards to import/export – UK/Taiwan? Since late May, I am having discussions with a Taiwanese company with regards to importing one of their patented products. Suddenly it all turned ‘cold’, in particular when part of one of their samples arrived ‘smashed up’ although it was packaged well and flown in by Fedex to London. When questioned, the relationship has gone really sour. Apparently, (also) due to the owners’ personal experiences during his time in the UK, some years ago. And also, according to them, due to some earlier exports from them into the UK, some of which have been lost, partially damaged, etc, etc. Therefore, they believe “If goods are found damaged or stolen in the U.K., there will be no way to know why it happened. Does it occur at the customs or in the process of shipment? Therefore, it is quite risky to ship goods to the U.K”. As a result, my contact person with the company has now informed me “instructed me to give up the UK market temporarily”. I am at a loss now here how to pursue this any further, and how to re-establish ‘trust’ with them, in particular as this particular product was aimed for a Autumn/Winter introduction in the UK with some other costs already incurred at my end. While I realise that this is perhaps not a straight forward ‘import/export question, I still would really appreciate your input on this. No, I haven’t personally imported anything from Taiwan. But I have imported goods from South Korea for example. I don’t think there’s much difference and the real problem is supplier here – their lack of interest in dealing with them. They could be located in China and do same thing, it doesn’t really matter. Don’t really know how you can fix this – if there are no alternative suppliers for these products, you have to try to convince them somehow? If you use courier for shipping, it comes with insurance. You can also buy insurance for sea freight shipments so you’re covered against damages during transit. But as I said, this sounds more like a one off thing with this particular supplier – maybe your order is too small for them to bother. Either way, you should ask them straight WHY they don’t want to deal with you? Is it order size, shipping problems or anything else. Is it true that China Post is not accepting anymore parcels of 30kg via Sea? I heard recently that they’ve brought it down to 20kg? Also what is EMS China and what’s the max weight they accept and is it expensive? Thanks in advance. I don’t know, I have never used China Mail for such heavy packages. EMS is a Chinese courier company and their packages in the UK are handled by Parcel Force, in the US – by USPS. For prices, weights etc. you’ll need to contact your supplier. But what if I wanted to order just 10 pieces as a trial number from a supplier in China, what would be the best way to go on that step by step? Depends on how big/heavy those 10 items are? If it’s something small, you’ll of course want to use courier for this shipment. But if it’s 10 chairs, you will still want to use sea freight or at least air freight as courier will be very expensive. Woodland Global(WG) are really great to work with, cannot recommend more highly. Even if you have several orders from different suppliers ready on the same week for example, leaving from the same port, WG are happy to cumulate all on one waybill saving you even more money on shipping. 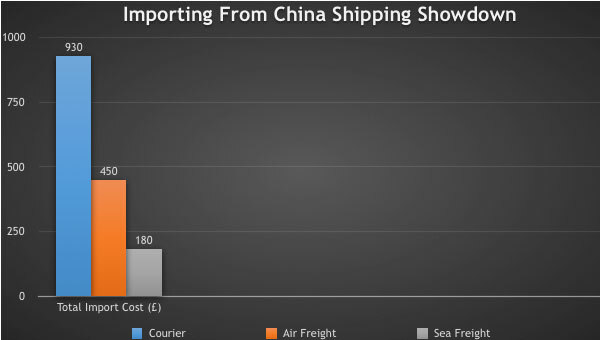 Sea freight is truly the way to import from China for orders above 1cbm. We’ll always use WG to get our orders from China. Thank you Andrew for recommending a great freight forwarder.